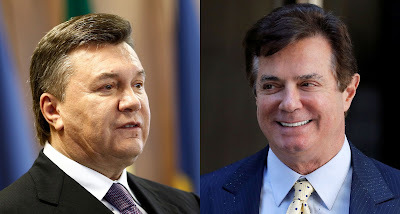 Viktor Yanukovych (L) and Paul Manafort. But that’s not how U.S. diplomats saw it at the time. A U.S. embassy cable sent from Kiev to Washington in 2006 described Manafort’s job as giving an “extreme makeover” to a presidential hopeful named Viktor Yanukovych, who had the backing of the Kremlin and most of Ukraine’s wealthiest tycoons. Making things harder for Manafort were the candidate’s rough manners and criminal past, which had dimmed his chances of winning elections. Oafish and inarticulate, Yanukovych had served jail time in his youth for theft and battery. He also had a hard time speaking Ukrainian – the national language – as he had grown up in the Russian-speaking province of Donetsk. Yet Manafort accepted the challenge of trying to make Yanukovych electable. The man paying the exorbitant bills for these efforts was an early backer of the Party of Regions, the coal and metals magnate Rinat Akhmetov, who soon began calling Manafort his friend. Such relationships were nothing new to the American political consultant, who on Monday pleaded not guilty to charges of tax fraud and money laundering brought by Special Counsel Robert Mueller. The indictment was among the first brought down as part of Mueller’s investigation into alleged collusion between Russia and President Donald Trump’s presidential campaign. Though the charges were not tied directly to Manafort’s work as the chairman of that campaign in the summer of 2016, they showed that his work as a political gun for hire is very much in the spotlight. Ukraine was by no means the roughest place Manafort ever worked. His roster of clients going back to the 1980s has included Congolese and Filipino dictators, along with a guerilla leader in Angola. But even this range of experience did not make the Party of Regions an easy customer for Manafort. The reputation of its leaders had been stained with blood since at least 2000, when some of Yanukovych’s political patrons were implicated in the murder of Georgy Gongadze, an investigative journalist who was abducted and beheaded that year. Manafort arrived in Ukraine in the wake of the Orange Revolution, a popular uprising that blocked the pro-Russian Yanukovych from taking power in 2004. One of the leaders of that revolt, an economist named Viktor Yushchenko, fell suddenly ill as his movement for European integration was gaining momentum that fall; doctors determined that he had been poisoned with dioxin, a substance that turned his telegenic face into a mask of green and yellow scars. Despite the poisoning, Yushchenko’s supporters carried him to victory in the 2004 presidential race, and the reformer put the country on a path to joining the European Union and the NATO military alliance. But these efforts were soon reversed. With guidance from Manafort and backing from Moscow, the Party of Regions made an astonishing comeback over the next five years, culminating in Yanukovych’s successful bid for the presidency in 2010. Among the first official acts of his tenure was to legally bar Ukraine from seeking NATO membership – a move that effectively granted Russia one of its core geopolitical demands. For his mastery of political campaigning, Manafort was dubbed a “mythical figure” in the Ukrainian press, and the country’s powerbrokers still give him much of the credit for turning the pro-Russian party around. “I can tell you he’s a real specialist,” says Manafort’s friend Dmitry Firtash, the Ukrainian billionaire and former partner to the Kremlin in the European gas trade. The alleged corruption of Manafort’s employers never made him abandon that job. Once installed in the presidency, Yanukovych began to amass an enormous fortune, easing cronies from his home region of Donetsk into key posts around the country. The President also built an opulent palace for himself outside Kiev, complete with a private zoo, a golf course and a restaurant in the shape of a pirate ship docked in his backyard. Yanukovych’s political rivals quickly found themselves under arrest. Chief among them was the former Prime Minister Yulia Tymoshenko, the gold-braided heroine of the Orange Revolution, who was charged with abuse of office and sentenced to seven years in prison in 2011. “It’s normal practice,” Yanukovych told TIME the following summer, in reference to his jailing of the opposition leader. He owed those ratings at least in part to Manafort’s political coaching, which included a new wardrobe for the President, as well as a coiffed hairdo and elocution lessons. But the jailing of Tymoshenko, which U.S. and European leaders denounced as part of a political vendetta, still dealt a severe blow to Ukraine’s reputation in the West. It was Manafort’s job to fix that, too. With money from the Party of Regions and its financial backers, he hired lobbyists in Washington to spin the imprisonment of Tymoshenko as an example of Ukraine’s commitment to the rule of law. “Their job is to say that white is black and black is white,” Tymoshenko’s daughter Eugenia told TIME in 2012. Such services did not come cheap. After another revolution in Ukraine forced Yanukovych from power in 2014, the national anti-corruption bureau discovered a secret ledger of off-the-books payments from the Party of Regions; Manafort’s name appears in the document 22 times, with payments worth $12.7 million designated for him between 2007 and 2012. The indictment released on Monday in the U.S. claims Manafort and an associate laundered the proceeds of his work in Ukraine through offshore accounts, and failed to pay U.S. taxes on the income. Through lawyers and in televised interviews, Manafort has denied receiving any illegal payments for his work in Ukraine. His attorneys also denied on Monday that Manafort’s work had advanced Russia’s interests in any way. But Manafort and his associates have not denied the lucrative side projects that he pursued while working for the Party of Regions. The biggest was an ultimately fruitless plan to purchase the Drake Hotel in Manhattan in 2008. One of the investors he approached for that project was Firtash, an early supporter of the Party of Regions, who says he was promised returns of as much as 50% as part of that deal. “It was partly our money, partly bank loans. That was the scheme,” he tells TIME. Details of the Drake Hotel negotiations remained secret until 2011, when Tymoshenko filed a lawsuit in Manhattan claiming that the project was in fact a money-laundering scheme cooked up by Firtash, Manafort and their associates. A judge in New York threw out that case on the grounds that it fell outside the court’s jurisdiction. Firtash, for his part, insists it was part of an effort by Tymoshenko to slander him and his allies in the Party of Regions. “By hitting me and Manafort, she wanted to hit Yanukovych and his electorate,” he says. What the lawsuit revealed, at a minimum, is how deeply enmeshed Manafort became in Ukrainian business and politics during the decade he spent working for the Party of Regions. Even after the revolution of 2014 turned violent – with police shooting down dozens of protestors in the streets of Kiev that February – the American consultant continued to assist his Ukrainian patrons. He helped the party rebrand itself after it was blamed for the revolutionary bloodshed, which ultimately took more than a hundred lives. After the Party of Regions effectively broke apart that fall, Manafort advised some of its former members on how to win seats in the post-revolutionary parliament. By that point, there was no longer any question over the party’s allegiance to Moscow. Yanukovych and his closest allies had fled to Russia as the uprising against them intensified, and President Putin guaranteed their security even as he moved to punish Ukraine’s new leaders for turning their backs on the Kremlin. In the spring of 2014, Russia sent troops to occupy and annex Ukraine’s Crimea region. It also sent weapons and fighters to spark a separatist rebellion in Donetsk and other parts of eastern Ukraine, fueling a conflict that killed thousands of people between 2014 and 2016. Throughout this period, Manafort continued to get regular updates on the crisis from his close associate in Kiev, Konstantin Kilimnik, a dapper and eloquent English-speaker who studied at a Russian military institute. But as his legal troubles in the U.S. have mounted this year, Manafort’s connections in Ukraine have broken down. Even Firtash, the oligarch who worked alongside Manafort to secure power for the Party of Regions, says he no longer calls his American friend for advice. “If I were to call him now, I’m sure he’d come visit me and we’d sit down and talk,” he says.